1. the new day designers are going up for presale on Wednesday! I set an alarm. I think i want the smaller one for next year? do you guys do Day Designers? i LOVEEE it. its my favorite out of the mainstream planners by far. the only issue i had with it was that it was SO big. but now they’re releasing a smaller version and I’m SO excited. 2. did you guys see this? i died. i want to be best friends with them. all of them. 3. so for a while now i’ve felt like i’m in the market for a nice leather camera bag. I never take my camera anywhere because i hate having it flop around at the bottom. it looks like ONA is the brand everyone RAVES about. originally i thought i just wanted a plain camera bag, but now they’ve roped me in with the messenger bag that i could use for work… I CANT DECIDE. also i should go straight leather right? i shouldn’t do the colors? HALP ME. tell me what you’d do? is it worth it? do you think they’ll go on sale? but i want it for fallllllll. wahhh i don’t wanna wait till christmas. ugh. what would you doooo? ugh maybe i should just wait till christmas and ask for it as a gift. 4. YOU GUYS. i ran four miles today. well walk/ran. i told you guys i’m training for the 10K and i’m following a couple different methods/schedules that i merged together. so today i did four miles at 2 minutes run/2 minutes walk. um. i finished with the fastest mile i think i might have ever run… ever? it was only 12:04 – but like, i seriously got a C in PE in high school because i couldn’t run the mile under 12 minutes…. no joke. my only C… EVER. this is a big deal for me! 5. remember way back when I told you guys about the chilling beer trick? i’m bringing another one to the table. You know the tabs on soda cans? 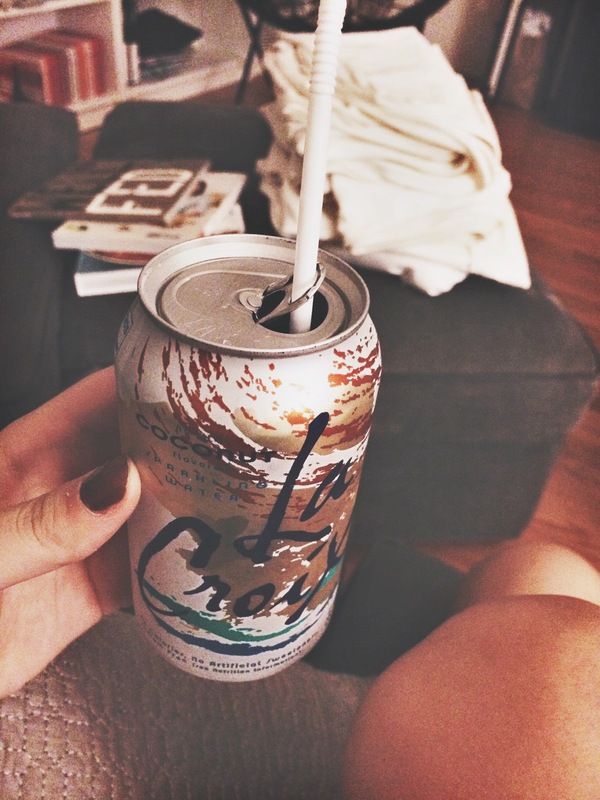 or in my case cans of la croix… i always stick my straw through the hole in the tab to keep my straw in place. the other day frankie asked me about it and i realized maybe not everyone does that? but it works like a charm, and i’m like a straw aficionado! 7. would you believe that I don’t think i watched ANY tv this week? literally. i think frankie wanted to kill me. he’s always asking “wanna watch a show?” i’m like…. ehhhh. i’m not into it right now? WHAT IS LIFE? is it because nothing good is on or am i just bored? i did watch a movie last night – beautician and the beast…. HAHAHAHA with fran drescher. where the hell IS she by the way? i used to love the nanny. 9. OKAY. this point. ugh i’m so excited. i don’t know if you guys have heard of tone it up. it’s one of my favorite sites to find workouts (they’re SO MUCH FUN) for free (but i also bought two of their dvds because i love them). our “trainers” karena & katrina always do seasonal 2 week challenges – fall is “frisky fall” and they’re so much fun! one of the parts of the challenge is to run 100/150 miles over the 8 weeks. I’m committing to the frisky fall challenge full on this year, i’ve never actually gone for one, but this whole30 outlook is changing me and i feel more capable than ever! another cool thing is that this year they’re doing something super special – its the charity challenge. they found an app called Charity Miles – which finds sponsors who donate $0.25 for every mile you walk, run, or bike. it’s SO COOL. and i thought all my runner friends out there would totally be into it! you don’t have to do anything different, just start up the app on your phone pick the charity you want to donate to and it’ll track how far you go and the amount you earned for the charity. 10. i think it’s such an awesome idea ^ that i started my own group in the app (Charity Miles) – thepikeplacekitchen (obviously) – that you guys can join and run along with me to rack up miles/dollars! A charity that I am really passionate about is the ALS association. you guys might all remember them from the ice bucket challenge, most people didn’t know what ALS even was before that challenge so i’m really grateful to the whole thing. My grandma passed away from ALS about ten years ago, but she lived with the debilitating disease for years and it was heartbreaking to watch. Unfortunately, there aren’t any ALS related charities that are sponsored through Charity Miles, so I decided to sponsor us myself! I’m going to donate $0.10 for every mile that gets accumulated in thepikeplacekitchen group over the next two months…. starting…. NOW. I’m going to cap my donation off at $300 dollars (because NY is expensive!) which equates out to 3000 miles. think we can run/walk/bike them? I do! I definitely do! 11. I’m also hoping family & friends & readers (who really fall into the friend category, let’s be honest) might consider sponsoring me over the next two months. If I can reach/surpass 100 miles in the time allowed by the “frisky fall” challenge, how many of you would be willing to donate $25 to the ALS Association? it would be honor system based, I can’t hold you to it – but i’d really love your commitment to give me some added motivation to crush this! If you’re willing to make the donation (or any donation at all, it doesn’t have to be $25 – that number just stuck out in my head because it’s what I WOULD earn through Charity Miles if they had an ALS related organization) comment here letting me know, or text/facebook message/email/call me! Oh and feel free to share this with anyone you think might be interested in donating, i’d really appreciate it!